It's back! It's back! It's back!!!!!!! Months ago, I wrote about being disappointed because one of my absolute favorite prints was being discontinued. Well, it's been reprinted!!!! I can't even tell you how excited this makes me! 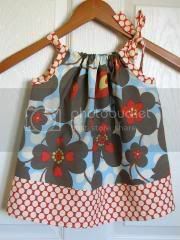 I just relisted the dress in my shop. Alas, the joy will be over soon enough because it's only being reprinted once, but I'm still excited. So, back in my shop for a limited time: Morning Glory Linen! !